I never had much time for The Jam and other Paul Weller projects, still... I really liked this. Sometimes there's stuff that you are not too impressed with and never gave much time too, but this project forces me to give time to this stuff, occasionally paying out. That said there are some tracks which are to the lyrical level of Ray Davies and a particular highlight is the last track here, which is so grimy, depressing and yet true that it is hard not to be affected by it. Actually this is an album that gets better towards the end. 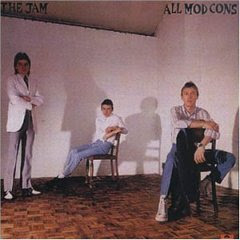 Despite that little rant, hats off to The Jam, because this is a nifty album. Strong undercurrents of British 1960s pop influences, particularly The Kinks, run throughout the album. Most obvious is the cover of The Kinks' "David Watts", an album track off their 1967 album Something Else By The Kinks. Many of the songs touched on socio-political topics. "Down in the Tube Station at Midnight" was one of the band's most successful chart hits to date, peaking at #15 on the UK charts, their biggest hit since "All Around the World", a non-LP single released between the band's first and second albums. The song "Down in the Tube Station at Midnight" is a first-person narrative of a young man who walks into a tube station (known as a subway in North America) on the way home to his wife, and is beaten to death by far right thugs. The lyrics reflect the tense atmosphere in late 1970s Great Britain, and the increase of violence related to the punk subculture and rise of racist skinheads. I just looked through the rest of the list. They put Heaven and Las Vegas on but not Blue Bell Knoll? They put Debut and Vespertine, but ignore Homogenic and Post? I can understand ignoring Post if only because you can piece it in, but it still confuses and annoys me. Yeah those are two that particularly annoys me. Heaven or Las Vegas is not, by far, the best Cocteau Twins album. And Homogenic is the best Bjork album, period. Actually I think all Bjork albums should be there, but I'd rather have Homogenic than Vespertine any day. Probably thinking of David Watts.